How do you convince your audience in 3 steps + best wishes for 2019! Best wishes for 2019! Full of development, insights and presentation pleasure! 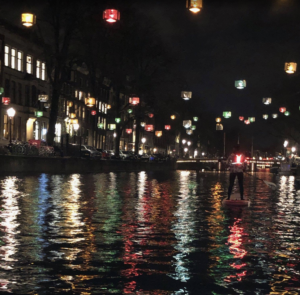 A few weeks ago, I started the fresh year, by supping over the Herengracht! It was truly magical to slide over the ink black water and paddle under those beautiful light art objects. So, besides sharing my new year’s card, also find enclosed a fresh 2019 Newsletter. 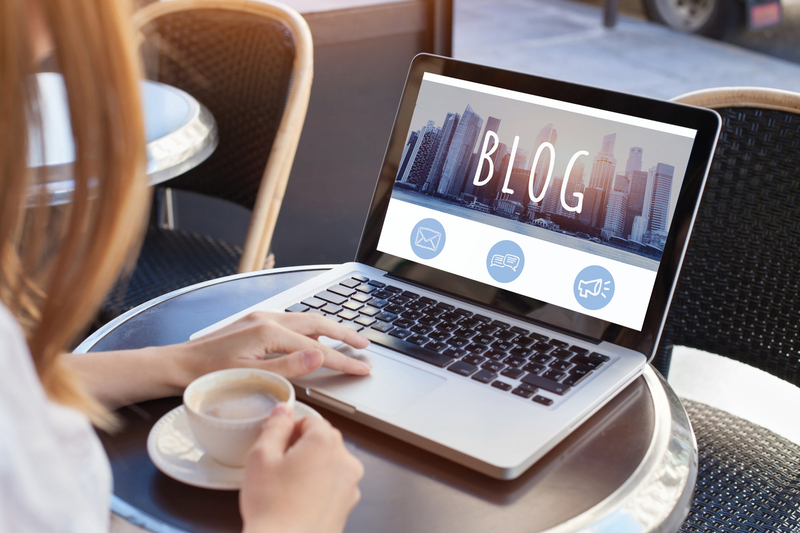 Wherein you may read, how to convince an audience in 3 steps! Or to put it differently, how can you not only lead the horse to the water, but make it drink as well? The horse that refuses to drink. In practice I often notice that many presenters use especially one element of the psychological process to convince an audience. Namely, a well-structured story based on good arguments. So, in short, this often does not provide a problem. Which does not surprise me. Since, the professionals that I encounter are often specialists in their field and know a great deal about their subject. However, there are still 2 other elements that are important and needed in the psychological process to convince your audience. And by convincing, I mean that your audience not only nods in an understanding fashion (logic), but that they go one step further and really embrace your idea, service or product. And these other 2 elements are often missing. So, in a nutshell, we need the 3 elements of the psychological process of convincing and not only one, so that your horse will not refuse the water bucket but will be eager and willing to drink it. What are these 2 missing parts? If you have ever followed a training or coaching session with me, the terms logos, pathos and ethos may sound familiar to you. According to rhetoric’s *1 these parts are needed to be a good persuasive speaker. In the PWI training we zoom in on each part separately. We practice with all of them and in the final presentation everything comes together. Simply put, these parts boil down to the following. The arguments, data, logic, structure. The emotions or appealing to the senses. We can also see and feel it. For instance: examples, pictures, metaphors, stories. We can feel it is a problem that needs to be solved, or a great desire that we need so strive for. The speaker is congruent, body language and what the speakers says are in sync. It is about use of voice, posture, gestures, contact with the audience. Is the speaker “behind” his position? Do we feel and trust the speaker wants the best for us? Do all these parts go well? Are the parts balanced and do they connect to the specific public we have in front of us? Then you can feel the magic of persuasive presenting. The presenter is clear, engaging and credible. And what is such great fun and truly amazing here? It is that these 3 parts, logos, pathos and ethos can also be consciously used in the structure of a presentation. You put them in a specific order, that coincides with the introduction, middle and ending of your presentation. In every part of your presentation (intro-middle-ending) you emphasize one of the parts. This order and emphasis on one of these parts is namely exactly following the psychological process, that the public needs in order to be convinced! (Note: this does not mean that you will not, at the same time, use these elements throughout your presentation anyways. You will merely emphasize a particular part in a certain manner at a certain point in your presentation). Let’s have a look at how this happens, by means of a beautiful proverb, that Nobbe en Mieras use in their wonderful book “story-design” *2. 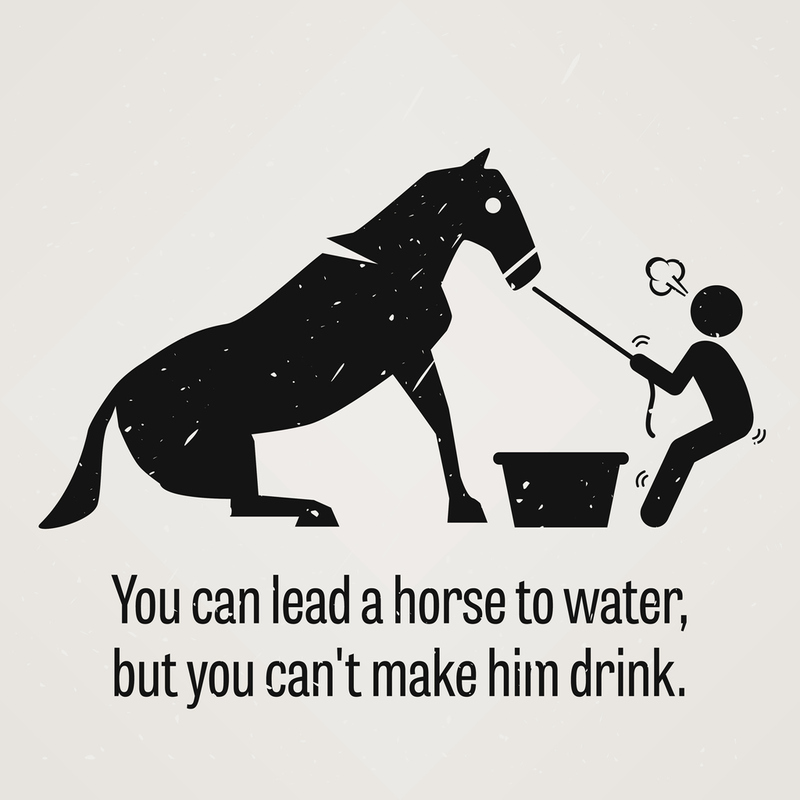 “You can lead a horse to water, but you cannot make it drink”. · If you want your horse to drink some water, you will first need to win its confidence. This is relatively easy. Cautiously, you will put your hand under its nose, so it can smell you. If its ears again erect themselves, you will gently rub its manes and whisper kind words. In this first phase of convincing, your credibility, or character is key. The others first have to trust you. ETHOS. · After this, you may get the reins and lead the horse to the water. You will have to remove any obstacles that will be in the way. Occasionally, you will have to hold a carrot in front and clearly give the horse direction. This second phase, represents argumentation, convincing your audience on a cognitive level. LOGOS. · Eventually you will be at the edge of the bucket, where you will enter the hardest, most difficult phase: how to make the beast drink? How to make sure your horse is eager todrink? This final phase “to appeal to emotion”, is crucial for having success with your presentation. Without emotion, the other party will not come into action. PATHOS. 1. Your character, or your personal credibility. This persuasive element will get a lot of attention in the introduction of your presentation ETHOS. 2. Your reasoning, or in other words a good story with good content. This will predominantly take place in the middle part of your presentation. LOGOS. 3. The emotion or being able to call on the correct emotion. Important throughout your story, but it will be central in your closure. PATHOS. In short, convincing an audience is not only about good arguments, but also about winning trust and using emotion in a functional manner. Because, if your audience cannot picture and feel that you and your information, product, service or idea can make a difference, your information is not really going to sink in and convince them. This means that you might get your audience to the bucket of water, but you will not be able to make them drink, without including character and emotion! How to do this exactly in practice? How to put Character and Emotion in, in the right manner? How to convince your audience in 3 steps and follow the right psychological path? So that you will become more effective and professional as a speaker? And know at all times what is exactly needed to build a convincing presentation. Also ideal if you have followed a training with PWI before and it is crucial for you to also be able to convince with your presentation. *1 Rhetorics: the art of effective or persuasive speaking. *2 Story-Design: Nobbe en Mieras.